Many towns have Arts Centres, usually run by a management group and a team of volunteers to put on events that enrich the cultural life of their town. We felt it was time that Kettering had one too, and rather than wait until someone else did something about it, we decided to make things happen. Many Arts Centres are housed in disused churches. We at St Andrew’s Church, town centre Kettering have a church building that is home to several thriving congregations, but which is still empty sometimes. So at a time when public, private and charitable funds are severely restricted we thought rather than buy or build a performance space, why not use our beautiful, historic, but flexible, town centre building. All performances take place in the actual church building and access is through the main glass door with the Arts Centre logo on it. There is a public car park in front and our own church car park behind (accessed via Crown Street). We have a licensed cash bar, located at the back of the performance space, at reasonable prices. Where possible we use the local Potbelly beer and biogegradeable “plastic” glasses. We always put on a programme of quality acts. We aim to book acts that we have seen personally or that we can wholeheartedly recommend through feedback from reviews, awards or personal recommendation. Acts that will put a smile on your face and a spring in your step, or challenge you to think, or broaden your horizons. And we aim to price competitively: you may well find many of the acts we put on are performing in Arts Centres in other towns with higher ticket prices. I attended yesterday for both shows of Patrick Monahan, and both were great. Although I travelled from 2 hours away to get there, so am unlikely to return, I just wanted to congratulate you on a fantastic venue. The facilities are great, but above all the staff were extremely friendly and helpful. I would certainly consider returning if there was something else there that caught my fancy, and my cousins only live about an hour away. Thank you again for a great evening, and maybe see you again sometime :-). Yes! Finally something about kettering. Can you tell me whether there is any disabled parking and access please? We have a slope to the main door along the Lindsay Street side of the Church. The best parking for this is to use the public car park outside the church (free but restricted to two hours Mon-Sat until 6pm, free and unrestricted after). The most convenient spaces are alongside the path next to the Church, although these aren’t designated as Disabled parking spaces. 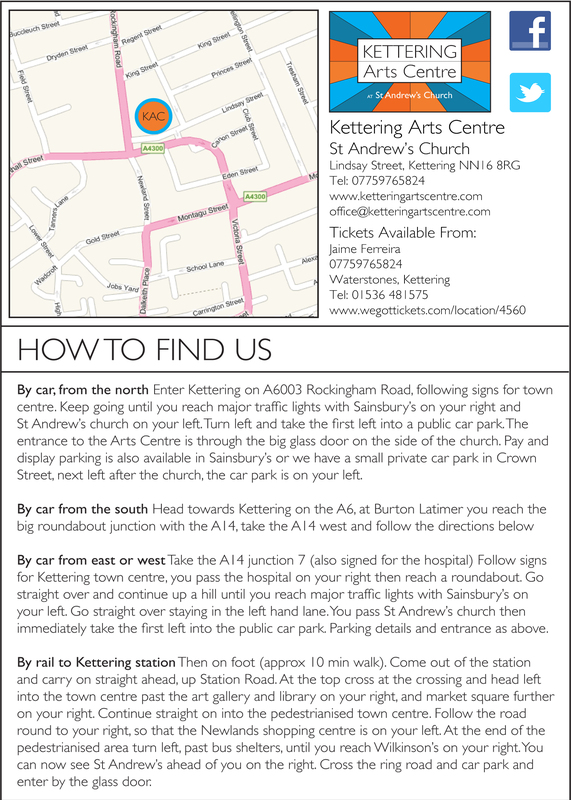 Our own Church Car Park has one designated space, nearest to the Church Halls, and is accessed from Crown Street. This is further away than the Public Car Park, though. Once into the building, the main area is level with the top of the slope. There is then a slope up to the toilets (and a disabled toilet with wall mounted grab-bars). I have now forwarded your request to our booking agent, if suitable they should get back to you shortly.